In anticipation of the upcoming Pagico 8, today we are releasing Pagico Plus 4 to Android handsets. 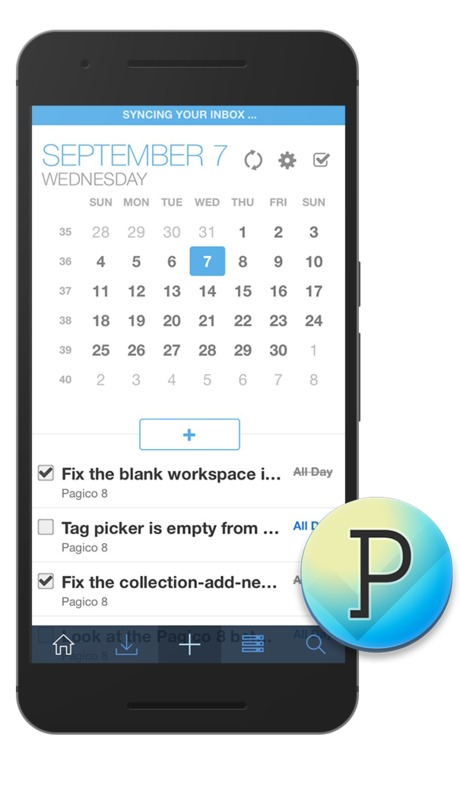 This version brings a redesigned phone app, as well as several minor but important improvements to make it compatible with Pagico 8. Download Pagico Plus 4 for Android today! P.S. : Did you know that Pagico Plus 4 is on iOS as well? 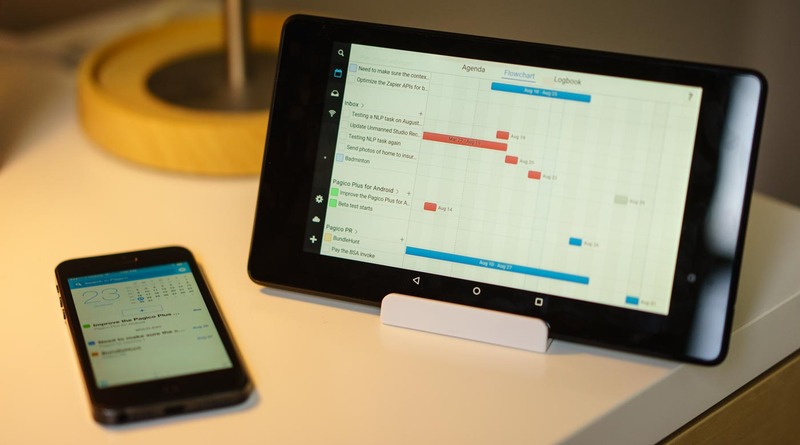 Are you using an Android handset or tablet? 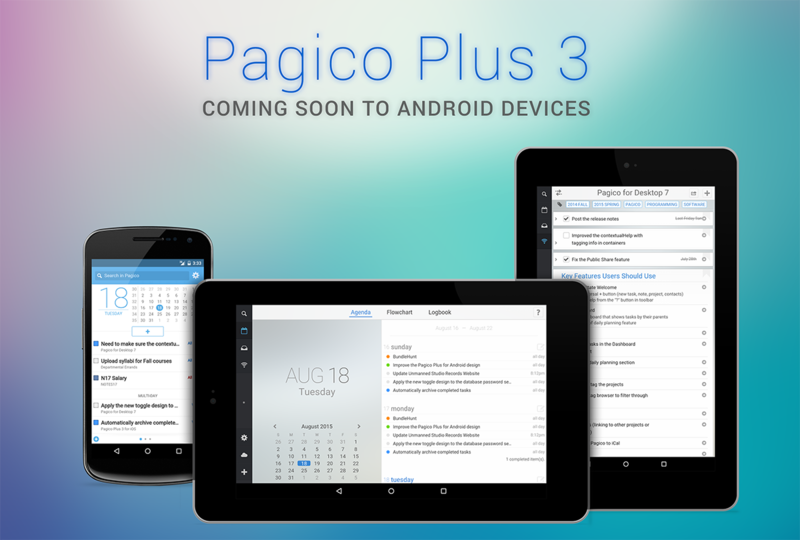 If so, then you need to get the Pagico Plus 3 for Android app! It’s on sale for just $8 USD right now, and it’s a free update to all existing Pagico Plus 2 for Android app users. Pagico Plus 3 for Android Beta has begun! If you’re interested in participating the beta as well, click here to sign up! Pagico Plus is the mobile companion app for Pagico. The Android version was initially released in summer of 2014. Since then, we’ve made tons of improvements to it, and rolled out a v3 which has been only available on the iOS platform. Now that the dust has settled with Pagico 7, we’re shifting our focus back onto the Android app. Pagico Plus 3 for Android will be better in every way than its predecessor, and we’d like to make sure it’s fully tested before it’s made available to everyone. So, we’re planning to run a public beta starting from Friday, August 28 to Sunday, September 13. If you’re interested in getting the Android app before everyone else, be sure to sign up! Pagico Plus 3 for Android going to look better, have a dedicated landscape design, and most importantly, work better. Last but not least, it is now sharing most of its code base with the iOS app, which means you’ll get more frequent updates as well! Stay tuned. Open beta is just around the corner. After months of development and weeks of beta testing, Pagico Plus for Android is finally ready! We are excited to let you know that on July 15, you will all be able to get Pagico Plus for Android on the Google Play store. Pagico Plus for Android will be available with an introductory price of $9.99 USD, and as a way to say THANK YOU, all beta testers will get Pagico Plus for Android for free. Pagico Plus for Android BETA is getting really close! As you may know, we have been working on an Android version of Pagico Plus, the mobile app for Pagico. I am happy to report back that we are getting really close to the open beta. For those of you who signed up for the beta, you can expect to receive an email about the availability of the Android app in the next day or two. Also, we appreciate your interest and effort to help us testing the app! Details about the beta program, including the exact starting date and closing date, will be addressed in the email message. For those of you who are interested in getting your hands on Pagico Plus for Android before the public, you can sign up for the beta program. Thank you all for your patience! The (long) wait is almost over, and we have just a few small things to wrap up.